Starting point: The central square Mitata. You enter the path from the bridge on the road Mitata – Viaradika. There is a road to the west that leads into the ravine. You walk alongside the river. You will come across an arched bridge. Then there is a half-ruined watermill. Along the route there are several podiums. You will also see many gardens on both sides. At the end of the small canyon you will find a nice garden that communicates with a dirty road. 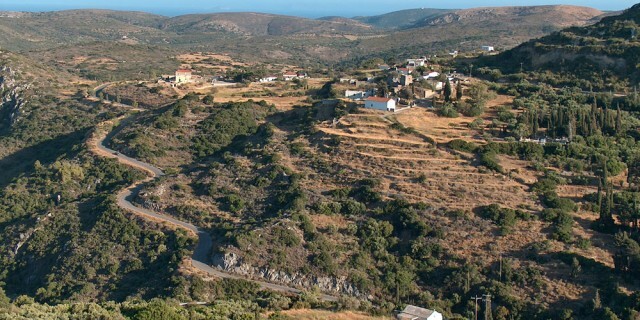 Take this road and soon on your right you will find a church in a small cave, Agios Ioannis. Later continuing the dirty road you will find the Black Cave. The road ends at a church called St. John and this is also built in a cave. Further down you will find the main road north of the village. You can make one stop, to combine the trip with a picnic.